Sikkim is situated in Eastern Himalayas spreading below Mount Kanchenjunga (8,534m), the third highest mountain in the world. Lying between 27 to 28 degree North latitude and 88 to 89 degree East longitude, it is barely 7,096 sq. km in size yet has an elevation ranging from 224 m to 8,540 m above sea level in a distance of 110 km from North to South and 64 km from East to West. The state’s about 64 km width is squeezed between the mountainous kingdoms of Bhutan and Nepal to the east and west respectively. The high plateau of Tibet lies 40 km to the north India’s and state of Bengal to its south. The various ethnic group has their own nomenclature for this enchanting land – the Nepalese call it Sukhim or new home, while Tibetans refer to it as Denzong or the valley of rice and to the Lepchas, the original inhabitants of Sikkim, it is Nye-al-Ale or heaven. Shrouded in heavy mist, the guardian deity Kanchenjunga protects the inhabitants of Sikkim. Omnipresent and mystical, Kanchenjunga finally yields to nature’s power and sheds its monsoon veil in autumn. Sikkimese celebrates this re-awakening with great pomp and ceremony during the Pang Lhabsol festival. Locals belief that great god created, from beneath the slope of this sacred mountain, the original man and woman from whom all Sikkim’s descended. Sikkim is conveniently divided into four regions – east, west, north and south. The most populated area is the eastern part which includes the capital town of Gangtok, followed by southern and western districts and finally the sparsely populated northern area with its inhospitable climate and steep ridges. Around midnight arrival in New Delhi. Upon arrival, you will be met by our representative and transferred to the hotel. In the morning you will drive to the airport for the flight to Bagdogra. After the arrival in Bagdogra you will proceed north of the state through the coniferous forests and terraced tea gardens to Darjeeling. Upon arrival, you will be transferred to the hotel in Darjeeling. In the evening enjoy the beautiful surroundings at Darjeeling. Very early in the morning you will drive to Tiger Hill (around 11 km) to enjoy the sunrise. Tiger Hill (2590 m) is the highest point in this area. 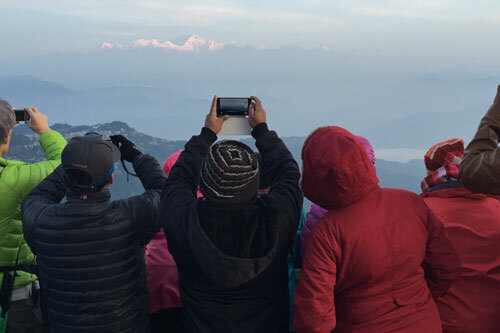 There is a breathtaking view of the sunrise on the Kanchenjunga mountains. The moments of sunrise from Tiger Hill are described by most of the visitors as unforgettable. After viewing the Tiger Hill you will visit the Yiga Choling monastery, built in 1850. It has the 14 feet Maitriya Buddha statue. After visiting monastery drive back to the hotel. After having breakfast you will visit the institute of Mountaineering and Zoological Park. Today you will leave the state of West Bengal and drive through the forests and tea gardens to Pemayangtse (The perfect Sublime Lotus) in Sikkim. Today after having breakfast you will visit the headquarter of the Nyingama sect in Pemayangtse. Then you will drive further to Kechopari Lake. After visiting the lake you will drive to Yuksom, the trekking base of Sikkim. In the evening arrive in Yuksom. After having breakfast visit the throne where the first King (Chogyal) of Sikkim was coronated in 1641. Then drive to Martam. Arrive in Martam by afternoon. Today you will drive to Gangtok and have full day sightseeing. In Gangtok, you will visit the Rumtek Monastery, Tibetology Institute, Enchey Monastery and Bazaar. After having sightseeing in Gangtok, drive back to Martam. After having breakfast you will drive to Lachung. Today you will drive to Yumthang Valley (Valley of Flowers) to see the floor covered with flowers and rhodendrons that bloom in forest. This place is surrounded by mighty snow peaks. fter visiting the Yumthang valley, drive back to Lachung. After having breakfast drive from Lachung to Martam. Today you will drive from Martam to Kalimpong. The beautiful mountain scenery and the abundance of flowers have made Kalimpong an attractive resort. In the afternoon visit Doorpin Monastery and Bazaar. Today you will drive from Kalimpong to Bagdogra for the flight to Delhi. In the evening arrive in Delhi.